McGee: What's our next move, boss? Gibbs: We're going to find Jacob Scott. We're going to kill him. Permalink: We're going to find Jacob Scott. We're going to kill him. Emily: When you find him, I want you to hurt him, as bad as he hurt my dad. 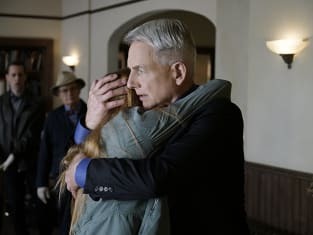 Gibbs: Emily, that's not going to help your dad. Emily: Just promise me that you'll make this guy pay. Gibbs: He's not going to have a good week. Emily: Glad we understand each other. Permalink: Glad we understand each other. Monroe: Let me guess. Why didn't I wait for you. Gibbs: Actually, why the hell didn't you wait for me? Monroe: Because of that, right there. Gibbs, I've been told I can be scary on a good day. But you? I'm sure you're scary every day. Even worse on a day like today. And that woman did not need to be scared. Kort: I shoot first, ask questions later when someone's standing over and old friend's dead body. Tony: Just get the files. Kort: Worried about your girlfriend, DiNozzo? Tony: [shoves him hard] What's that supposed to mean? Kort: Are you going to call your attack dog off? I understand you've been looking for me? Well here I am. Permalink: I understand you've been looking for me? Well here I am. Scott: I didn't have to turn myself in. Scott: Because of you. When Ziva David's name came on my radar, I did my homework. That led to you and I learned all I need to know pretty quickly. I came to you because I believe you're someone who won't stop until you find the truth. I already know the truth. The truth is, I'm innocent. And you're going to help me prove it.